Mobile recording couldn’t be easier! PreSonus® Capture™ for iPad® brings professional-quality recording to the Apple iPad yet is lean, fast, and easy to use. How fast and easy? Start recording with just one tap! Visit the Apple App Store and get started immediately with Capture Duo, a free two-track app—or go multitrack with Capture for iPad for only $9.99 U.S. Either version is a perfect mate for our AudioBox® iOne or AudioBox iTwo mobile recording interfaces but Capture for iPad works with any iPad-compatible audio interface and with the iPad’s internal microphone. Record stereo for free; record multitrack for a song. Developed by the same engineering team that brought you our Studio One® DAW, Capture Duo lets you record and play two tracks with up to 24-bit, 96 kHz fidelity. Want to go multitrack? Capture for iPad can record up to 32 tracks simultaneously, depending on how many streams your audio interface can handle. Other than track count, the two apps are identical. 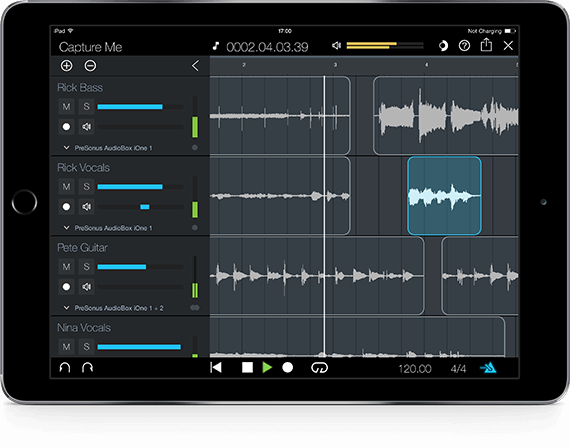 Although designed primarily for sound acquisition, Capture for iPad supports essential event editing for basic cleanup, and editing audio is simple and intuitive, using basic finger gestures. Transfer songs from iPad to computer—wirelessly. With either version of Capture for iPad you can wirelessly transfer your songs directly to Studio One for Mac® or Windows® for editing, mixing, and mastering. Your songs open in a new Studio One document, ready for you to continue creating without missing a beat. Learn more about using Capture for iPad with Studio One. With Capture for iPad/Duo, you can record anytime, anywhere. But your computer offers many advantages when you want to edit and mix—especially if you have PreSonus’ award-winning Studio One® DAW for Mac or Windows. That’s because Capture for iPad/Duo can record and save multiple songs on an iPad, then wirelessly transfer them directly to PreSonus Studio One. From there, you have all the advantages of mixing and editing with the world’s fastest and easiest to use professional audio-production software. When your project is finished, Studio One lets you share your mixes on SoundCloud™ without leaving the DAW. In addition to wireless transfers, songs and individual tracks can be copied using iTunes if the iPad is connected to the computer with a USB cable. Safe and efficient mobile recording. Losing a recording because your iPad battery died before you could save is a horrible feeling. But you’ll never have that miserable experience with Capture for iPad because the app auto-saves your song after each recording and recovers your tracks from an auto-saved backup if your iPad fails. In addition, all recordings are saved in Apple Lossless format to efficiently use iPad memory, reduce transfer times, and make optimal use of your iPad’s processor and battery. Of course, if you transfer your Capture recordings to Studio One, you’ll be able to save in a variety of audio formats. Transferring wirelessly is an awesome utility with the files showing up immediately in Studio One and ready to be edited/processed further.